Yesterday, I shared a quote from Tolkien that really captured how the Christian worldview has been weaved into Tolkien’s works: Be Ready When I Return. Today, I have another quote from the great author of the 20th century. This time from The Two Towers. What wonderful words! This is said after Sam has found Frodo Baggins on the ground stung by the giant spider Shelob. Gollum had betrayed Frodo and Sam by leading them straight into Shelob’s lair. Sam is falsely accused by Gollum for eating the rest of the food they all had and so Frodo and Sam split. But, thankfully Sam comes back for Frodo. He sees that he has been put to sleep by the spider’s venom and fights off Shelob himself! Then, he decides to continue the quest to destroy the ring without Frodo. As he is deciding what he must do he knows that he must take the ring, yet he feels unworthy. This is where we see him say the quoted words above. 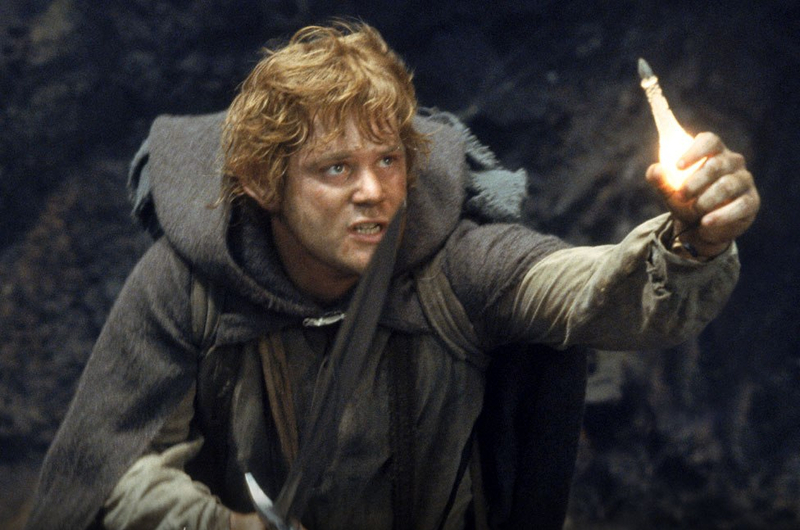 Samwise views himself as not adequate to take the ring and destroy it, but it draws to mind that neither was Frodo or Bilbo worthy to bear the burden of destroying it. He reasons that if the Enemy were to find the ring that would be the end of all good. Sam takes the ring and decides to press on. Not because he put himself forward to do it, but because he had been put forward. He was the right person then and there for the task. This quote reminds me of Paul’s words to the Ephesians. Let me show you what I mean. “Even as he chose us in him (Christ) before the foundation of the world.” God chose us before we could even try to merit his grace and favor. Just as Frodo and Bilbo did not put themselves forward to the task of bearing the ring, we too have not “put ourselves forward” to receive God’s blessing, grace, and salvation. He chose us before the foundation of the world. And look at all the blessing that flow from him choosing! He has blessed us with all the spiritual blessings in Christ. He chose us to be holy and blameless. He predestined us to adoption as sons through Christ Jesus according to His will. We are blessed in the Beloved (Christ). In Christ, we have redemption through his blood. In Christ, we have forgiveness for our trespasses against a holy God according to the riches of his grace. His grace has been lavished upon us in all wisdom and insight! He made known to us the mystery of his will set forth in Christ! His plan has always been to unite all things to himself, including us! In Christ, we have received an inheritance, which is the Kingdom of God predestined to Christ and his people from eternity past! He works all things according to the counsel of his will, not ours! We give praise and glory to God in Christ. When we heard the gospel and believed in Christ we were sealed by the Holy Spirit. We will not lose our salvation because of the great love that God has loved us with and his seal that cannot be broken, which is the Holy Spirit. The Holy Spirit is the guarantee or down payment, to our inheritance which we WILL possess. All of these blessings are to the praise of God’s glory and grace. I am sure there are more there, but man…. What a blessing, literally, it is to be in Christ! We did not put ourselves forward to God as if we were worthy to fulfill his will. No, he put us forward, before the foundation of the world in eternity past, that we would be in Christ and glorify the LORD of Lords. To the Praise of His Glory and Grace!